An anthology for people who love concise writing that is intense, entertaining and educational. 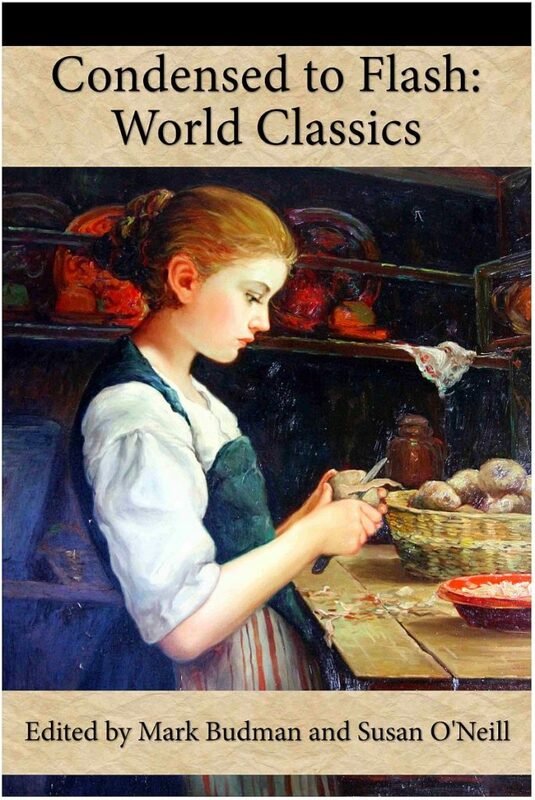 This anthology features variations on themes of world classics, condensed to 500 words or fewer. We have a retelling of The Ramayana, The Letters of Abelard and Heloise, The Raven, Beauty and the Beast, Cinderella, Anna Karenina, Coyote and Eagle go to the Land of the Dead, Rumpelstiltskin, The Hound of the Baskervilles, The Odyssey, Crime and Punishment, Pygmalion, Metamorphosis, The Frog Prince, Macbeth, Puss in Boots and many more. The 26 stories of this anthology, from famous and yet-to be-famous authors, span the breadth of classic literature in fewer than 14,000 words altogether, while adding new dimensions and just plain fun to the job, and that is a marvel. These updates, re-sizes, re-casts of classics are brilliant and entertaining. It’s a great idea for book, and few could bring it off like these two well known flash editors. These aren’t just summaries or fractured fairy tales we’ve seen before, but dazzling literary works. In these flash stories, some of the greatest classic stories of literature—from Macbeth to Rumpelstiltskin to the Frog Prince—have been retold in fractal form, each narrative reduced to its essence by true masters of compression, the 23 flash fiction writers brought together in this volume by the knowing editors, Mark Budman and Susan O’Neill. Surely this will become a valuable teaching text for writing workshops. The classics in these stories are never condensed in an obvious way. Instead, they are presented with clever variations that reopen them for debate. Some stories have alternative endings or previously untold epilogues. Others are told from the perspective of a side character or from a protagonist who has changed gender. In one, the heroine is being interviewed. In another, the reader changes into the hero. Each unexpected twist or extension deconstructs the original plot, leading to insights into both classic storytelling and the social and political issues of our time.